POWER TO HEAL tells a poignant chapter in the historic struggle to secure equal and adequate access to healthcare for all Americans. Central to the story is the tale of how a new national program, Medicare, was used to mount a dramatic, coordinated effort that desegregated thousands of hospitals across the country practically overnight. Using the carrot of Medicare dollars, the federal government virtually ended the practice of racially segregating patients, doctors, medical staffs, blood supplies and linens. POWER TO HEAL illustrates how Movement leaders and grass-roots volunteers pressed and worked with the federal government to achieve a greater measure of justice and fairness for African-Americans. "Compelling...Details[s] the struggle to bring long-overdue change, along the way detailing the achievements of inspiring figures...While most documentaries on the Civil Rights movement focus on the political and educational aspects of segregation, this one addresses a much less remarked - if no less shameful - chapter in American race-relations history. Highly recommended. 3.5 stars." "A remarkable film...Essential viewing for anyone interested in the deeper conversations about health disparities and the pursuit of equality today." 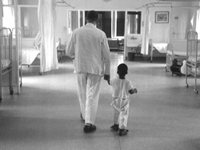 "An excellent documentary on a lesser-known chapter in the American Civil Rights Movement: the desegregation of hospitals, and the heroes - both the famous and the more obscure - who made it happen. A must-see for anyone wanting to learn more about the history of race and medicine in America and how it began to change during this pivotal time."